PAPUA New Guineans are being turned away from the Torres Strait Islands over fears they're spreading a deadly disease, which has already claimed one life. Locals say the state and federal governments aren't doing enough to stop a tuberculosis (TB) "epidemic", which has hit the islands and could spread to the mainland. Torres Strait Regional Council Mayor Fred Gela says since an elderly local woman died from TB in April the council has refused to allow traders from PNG to visit the islands. Council staff are required to sign temporary permits before someone from PNG can visit any of the 14 islands under a treaty agreed by the two countries. Last year up to 26,000 individual permits were issued. Mr Gela says the council has been forced to act because there are no health checks in place and he fears more people could die. "My people are vulnerable and susceptible to contracting TB," he told AAP. "Some of our communities are right on the front line, they're only a 10 minute boat ride from the PNG border. "The reason is strong and simple: we're very, very concerned." 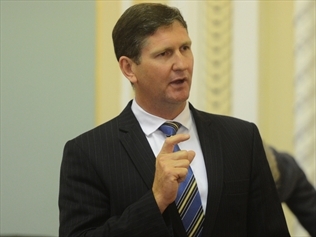 Health Minister Lawrence Springborg says Queensland isn't receiving enough compensation to treat the hundreds of sick people from PNG who travel across the border each year. He begrudgingly signed a deal on Wednesday that will see the state receive $18 million in compensation from the Commonwealth over four years. He wanted an extra $10 million a year and a commitment to close the north's "porous" borders. "This border is about as porous as a spaghetti colander," Mr Springborg said. In 2011/12 about 1100 Papua New Guineans visited Queensland Health facilities in the Torres Strait and Cairns, 15 of whom had tuberculosis. In one case, the cost of a patient's treatment came to $1 million. Mr Springborg says Mr Gela wants to close the border, but only the Commonwealth has the power to do that. Mr Gela described the extent of the TB outbreak in the Torres Strait as an epidemic and says the situation has worsened over the past decade. money is being spent on stopping sick people crossing the border. "The Australian government is pouring money into an international country with very little measures ensuring accountability," he said. Mr Gela warned authorities not to view Torres Strait as "out of sight, out of mind," as diseases that spread through that area would soon reach the mainland. "This is everybody's business," he said. "The state and federal governments need to front up to this issue and deal with it." The Torres Strait and Northern Peninsula Hospital and Health Service says asylum seekers have been treated in far north Queensland hospitals. Spokeswoman Simone Kolaric says a Syrian man, who came via PNG, was brought to a hospital by immigration officials a couple of months ago, amid concerns he had TB.